Death comes to us all and all that lives must die. Of course, drawing the Death card, number 13 in Tarot's Major Arcana, doesn’t usually mean we are about to meet an untimely demise. It does, however, remind us that death is always all around us as an essential part of the cycle of life. As the Wheel of the Year turns towards Samhain, or Halloween, and winter draws near, we can see the leaves falling from the trees and the last flowers and fruits of summer coming to an end. But on autumn walks in woods or parks we see fungi thrive on rotten tree stumps, breaking down the dead matter and returning it to the soil; enriching the earth so the cycle of life may start once more. Transformation and spiritual enrichment is what Death is about in Tarot. The next card in line at the top comes from the Rider Waite Deck deck - possibly the most influential set of Tarot imagery. It shows a skeleton on a horse trampling the body of a king. A bishop prays before the pale rider, a woman swoons and looks away – perhaps with grief or perhaps with fear - and a child looks on with curiosity. It tells us that death is the great leveller, but also shows us various attitudes people have in the face of death. Of course death is scary and of course we grieve when a loved one dies. Spirituality can lessen that fear if we have faith that there is life after death. The card also hints at the future. The banner held high shows us a white rose symbolising rebirth – mystical or natural; flowers will later bloom on battlefields. In the distance the sun is rising beyond twin towers reminiscent of the Moon card - a new day will dawn. Robin Wood's card (the third at the top) seems to combine the meaning of regeneration with beauty and gentleness. The butterfly is a symbol of personal growth through transformation as well as a metaphor for the soul while silver birch trees symbolise new beginnings. The Vanden Borre Bacchus Tarot (the last card at the top) shows Death as a skeleton with a scythe – the image of the Grim Reaper. Although flowers are growing to one side, they look as though they might get harvested. It is a stark reminder that death is inevitable and can strike at any time. Sometimes if you draw the Death card it really is a warning to take a bit of extra care with your life. Live more healthily and be aware of risks. 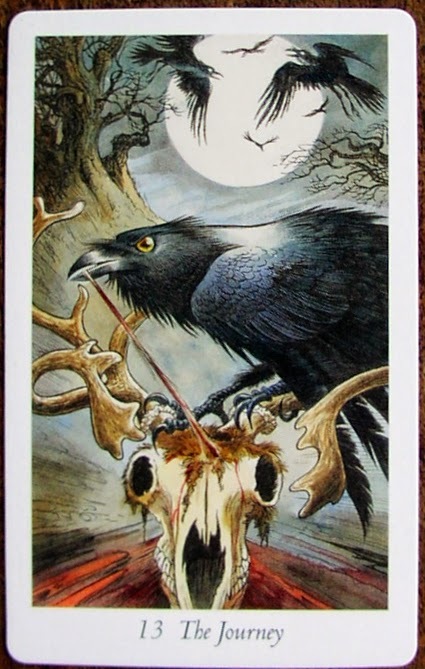 The Wildwood Tarot renames Death as The Journey (pictured above right), but the card shows the skull of a reindeer and a carrion crow - the meaning is that the journey of life takes us into death. The Wildwood Tarot positions each card on the Wheel of the Year and The Journey is placed at Samhain – the season of the dead, as I mentioned earlier. This is a time of year to remember and mourn those who have died and also to look ahead and to reflect on our own mortality. We should make sure that we live whatever span of time we have left without regrets. Death’s theme shows some interesting variations in the cards along the bottom row. On the left, the The Lord of the Rings Tarot shows Gandalf the Grey fighting the Balrog. It is a fight he loses, but gains enough time for the ringbearer’s party to escape. He later returns from the dead transformed into Gandalf the White. The definition is: “Clearing away negative conditions in order for something better to flow in.” I would also sometimes interpret that image as making a personal sacrifice for the greater good. The Sherlock Holmes Tarot has The Gallows as Death and indicates that it can mean an abrupt and unsettling change. It goes with the theory that the card seldom means actual death, but can mean a sudden change of fortune. The Steampunk Tarot depicts Spring-heeled Jack “the scavenger who sees off things that have run their time”. The meaning is again about outworn ideas or situations ending. I would also interpet both those cards as having to accept the inevitible, however unpleasant, and then moving on. The final card on the picture is from another Steampunk deck, the Victorian Steampunk Tarot, and points out that the Victorians experienced far higher rates of mortality than we do today in Britain. They ritualised their mourning to help them come to terms with loss. 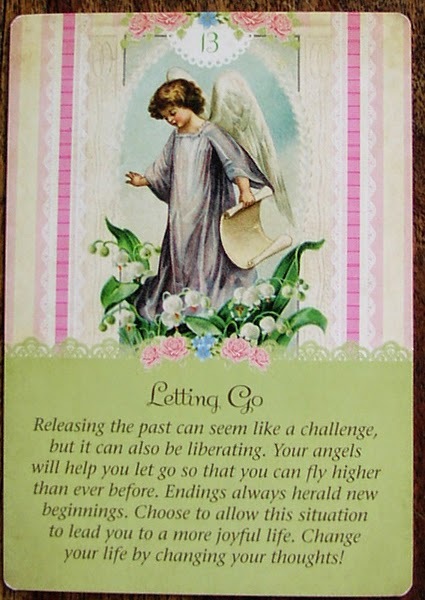 This card reminds us that letting go can be hard, especially when we feel we have been left with nothing but the bare bones of existence, but it clears the way for a period of renewal and reinvention.